The ABS plastic is durable enough for rugged jobs and comes in a variety of colors. 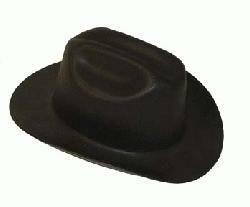 In addition, the cowboy hardhat shape provides sun and weather protection for your face, neck and ears. This western hard hat is a unique design and works great for most standard applications; however, it is not recommended for horseback riding. Finally, the cowboy hardhat comes with an adjustable ratchet suspension, washable sweatband, and a four-point suspension for all day comfort. Fits head sizes 6.5 to 8. Made in the USA. Brim measurements are 15 inches from front tip to back tip, and 14 inches for left to right tip.